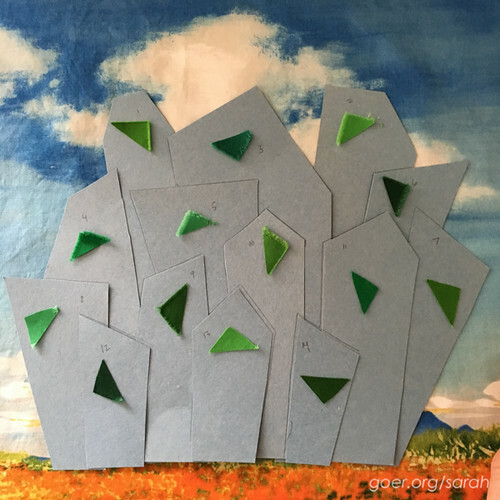 It's been quite a while since I have been able to carve out the time to participate in Color Play Friday (or blogging regularly in general). :-/ I'm happy to have jumped onto this week's event. I love the bold color of the flower and decided to stick with floral as my inspiration, in addition to the color palette I pulled from the photo. I have to say, that black print that I chose isn't working for me 100%... it's got little blue bits. Hm. The photo on the Hawthorne site showed it a little more pale and the blue bits looked green to me. I'm leaving it in because I *do* like seeing the pale red and gold to complement the first two fabrics. In other news, why do I still not own any Painters Canvas!? Posted in Fabric. 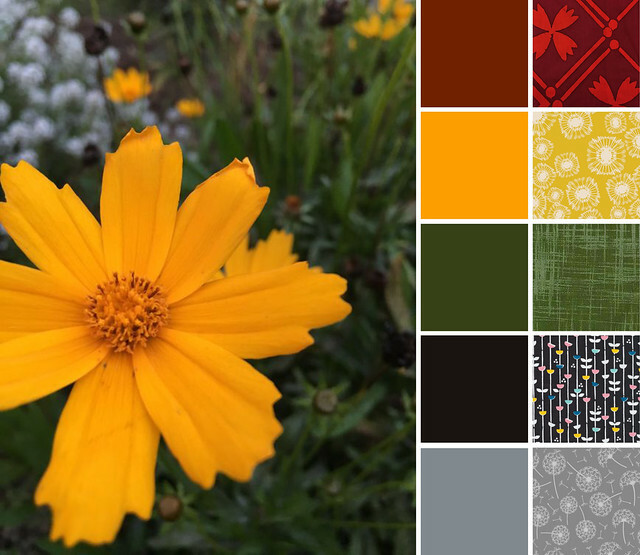 Tags: Color Play Friday on May 27, 2016 by sarah. My new nephew, Jordan, was born at the end of March. 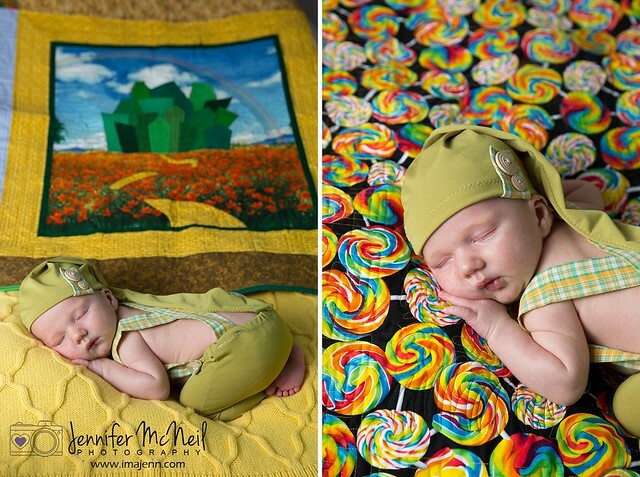 I knew that they were using Wizard of Oz for the baby's room, and asked my sister, Jenn, if she'd like me to make him a quilt. 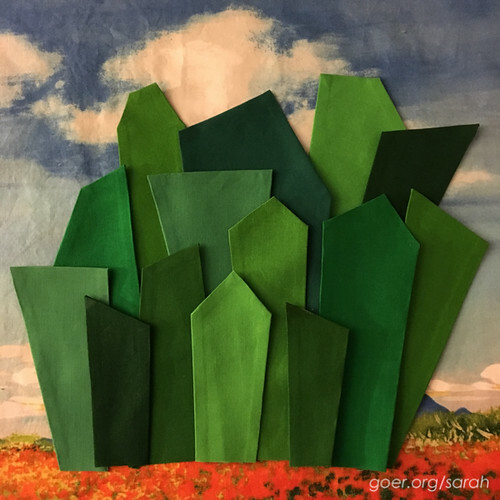 She was most excited about the Emerald City and the poppies. I refrained from asking for too much input and confirmed that she trusted my judgment. 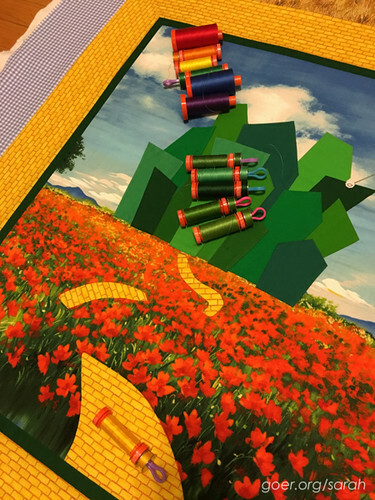 ;-) There are some beautiful appliqué Wizard of Oz quilts as well as many versions made with licensed Wizard of Oz fabric. I knew I didn't want to go either route. I also knew that Jenn really appreciates dense, decorative quilting. The hardest fabric to find was the poppies, but I finally found this perfect panel on Etsy. I trimmed it and positioned my Emerald City buildings in such a way that I covered up the trees on the panel. That also dictated the size of my center section. 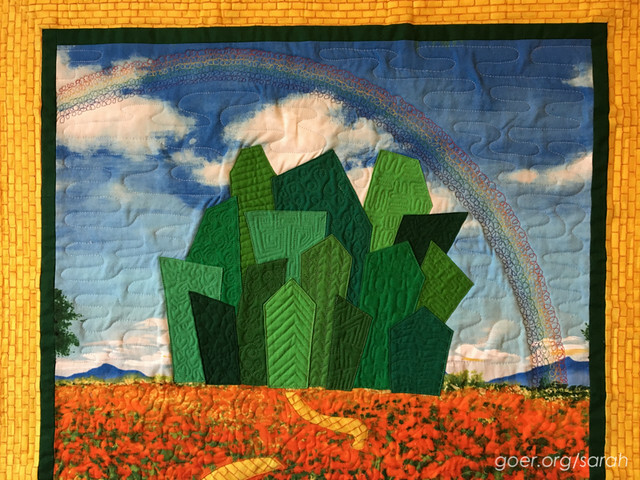 I started by designing an Emerald City, and I ordered the Kona Wondrous Woods bundle of green fabrics. I did decide to appliqué the buildings in place. 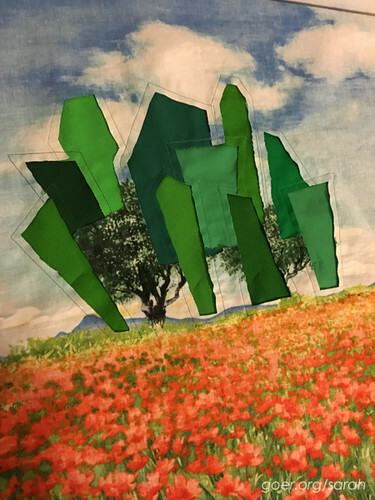 I used my paper templates to cut my fabrics with a 1/4" seam allowance and pressed under the edges, using a little Best Press. Then I machine appliquéd them in place one at a time, cutting out the background fabric as I went. I decided that since I didn't want to do a lot of appliqué, I could represent each of the main characters with a fabric that related to them: blue gingham for Dorothy, straw for Scarecrow, grey solid for Tin Man, and a dark brown to represent the Cowardly Lion's fur. I also ordered yellow brick road fabric. 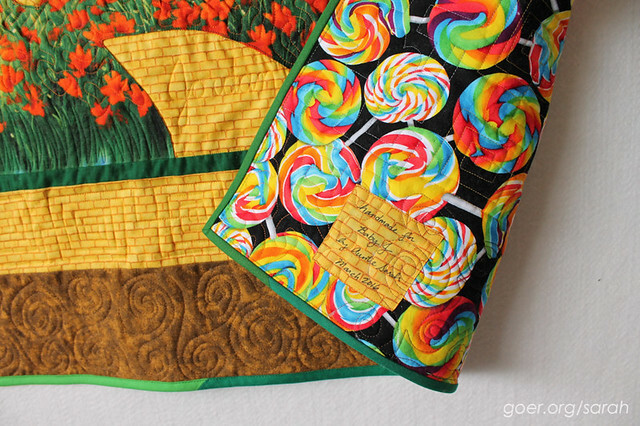 When I ran across the rainbow lollipop fabric I knew it would be perfect backing. 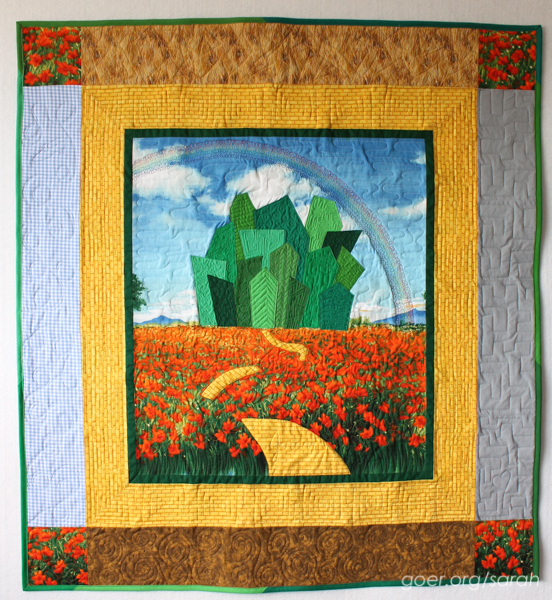 I used reverse appliqué to piece the yellow brick road through the poppies. I kind of made it up as I went. ;-) Then after a thin green border I added the yellow brick road. Again making things up as I went, I mitered the corners on this border since I thought the lines of the bricks would be distracting otherwise. 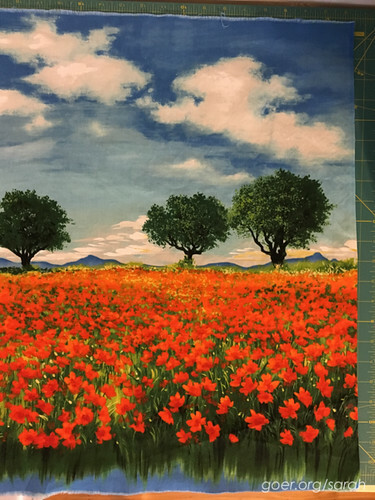 I used the character's fabrics for the final border, adding poppies in the corners. Then the real fun: all the quilting. 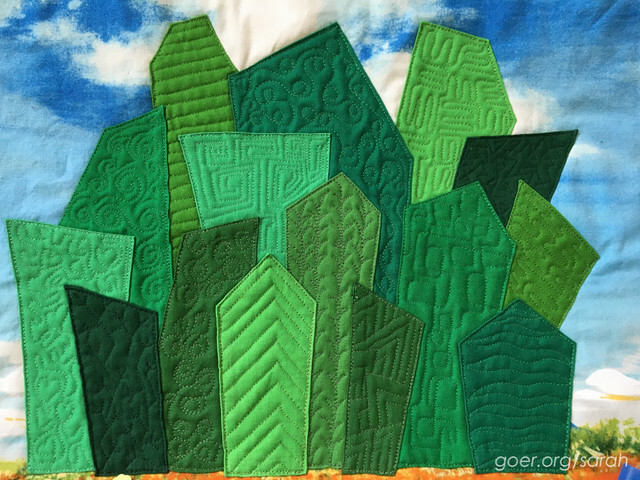 I knew I wanted to do dense quilting on all the little buildings. 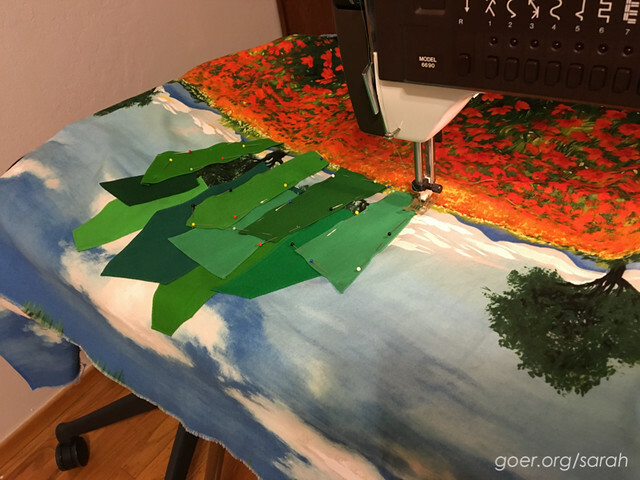 I purchased six different colors of green thread so my quilting would blend with each fabric. 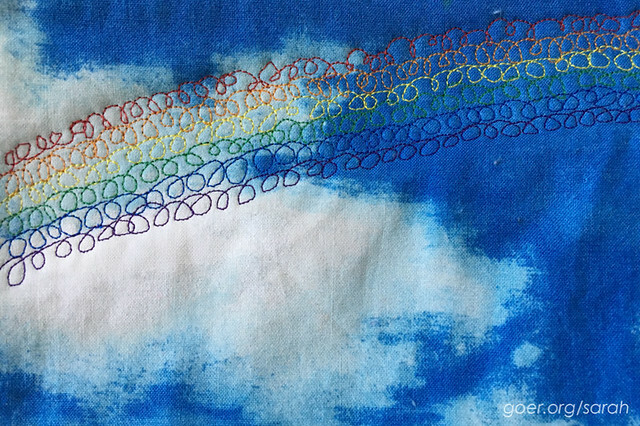 The rainbow was quilted across the sky. 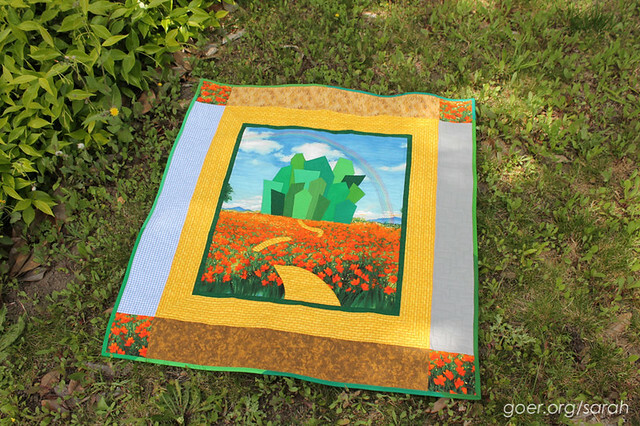 I filled the rest of the sky with a meandering switchback motif and used square spirals on the yellow brick border. 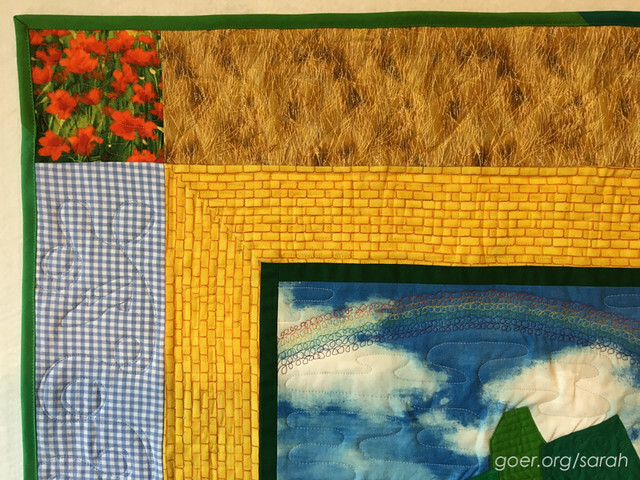 For each character border I wanted to use a motif that was a nod to that character, and in each I quilted an icon that represented the character: Dorothy's slipper, a patch for the Scarecrow (hard to see in the photos), Tin Man's heart and a crown for the Cowardly Lion. I quilted the quilt using a whopping seventeen colors of Aurifil 50 wt. thread. 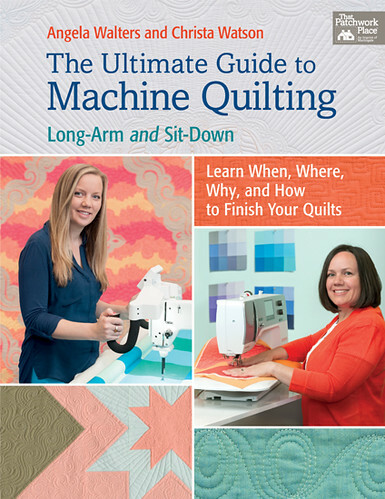 Just before I started quilting this project I received my copy of The Ultimate Guide to Machine Quilting by Angela Walters and Christa Watson. I found it hugely helpful as I chose which motifs to use. In total I used 24 different quilting motifs on the Wizard of Oz quilt (plus cursive writing, and quilting the icon for each character). A number of these were directly from or inspired by the book. 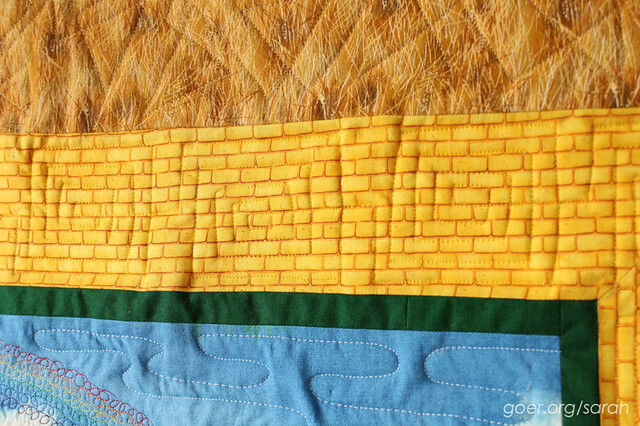 I used a variation of Angela's square spirals (p.62) in my yellow brick road border. I took inspiration from Christa's loops and hearts (p.81) for quilting stipples and hearts in one of my buildings. 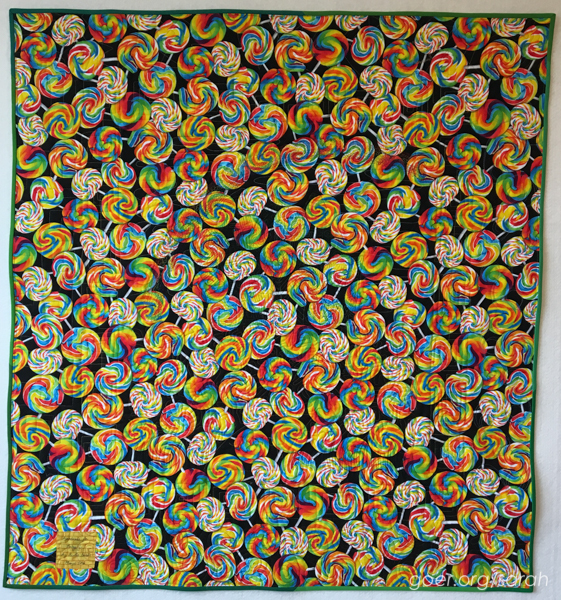 Her telephone cord quilting (p.81) is essentially what I did for my rainbow. I used Christa's double swirls (p.82) on another building. I really liked the swirl hook (p.96), but muscle memory took over when I started the section for the cowardly lion and I ended up just doing swirls. I used Christa's ribbon loops (p.125) in my Dorothy section. I also used her not touching wavy lines (p.133) and small square spirals (p.133) on my buildings. 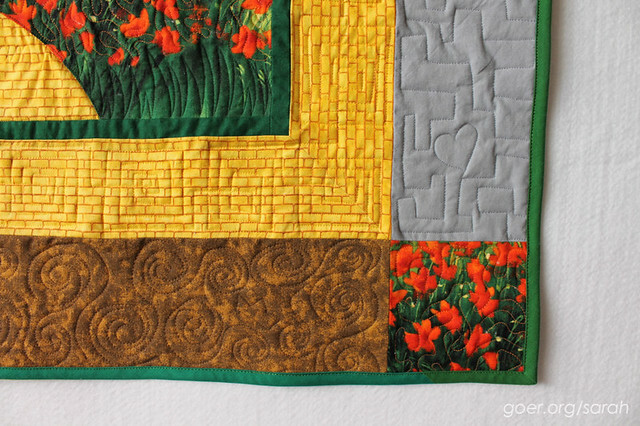 This project was great for trying out a number of new-to-me quilting motifs on a small scale. It reminds me of the first project that I free-motion quilted, where I used a different motif in each square of the quilt. I love the side-by-side versions of each quilt in the book where Angela and Christa each show their take on how to quilt the same project. As a domestic machine quilter, I found that I could take inspiration from both Christa's and Angela's quilting designs. There are over 50 different machine quilting motifs in the book as well as 10 complete quilt patterns. This will be a go to resource for me and I've already used it on other projects! I'm linking up to Finish It Up Friday and TGIFF. Posted in Quilting. Tags: baby quilt, finished quilt on May 6, 2016 by sarah.